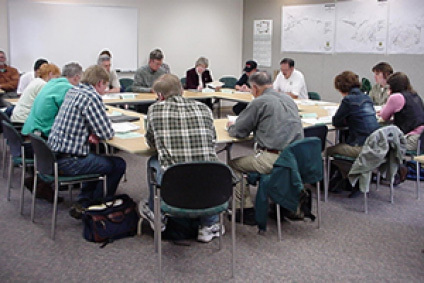 A resource management meeting held with the U.S. Forest Service. Photo courtesy of US Forest Service. Land and Resource Management Plans, which are also known as “forest plans,” guide the individual U.S. Forest Service (USFS) units in meeting their responsibilities as federal land managers. Forest plans carry particular weight in areas where existing regulations, laws and policies do not provide clear or specific enough guidance. According to the National Forest Management Act, forest plans must be revised and updated every 15 years and must meet a range of requirements in their development. In 2012, a new rule was created that sets requirements for the planning process. The 2012 rule aims to ensure that forest plans support ecological, social, and economic sustainability goals and that adaptive management and the most recent science-based information are incorporated into forest planning. It also created new requirements for public participation that are intended to improve collaboration with local communities and diverse stakeholders about forest management activities. Finally, it created opportunities for the public to engage with the planning process to ensure that forest plans are responsive to the public interest. The planning process for forest plans involves three distinct phases. First is the assessment phase, where the ecological, social and economic conditions within the national forest unit are evaluated. Second is the plan development phase, where the information gathered in the assessment process is translated into management goals and guidance to reach those goals. Lastly, the monitoring phase involves establishing indicators to measure success and track progress toward forest plan goals. The assessment phase, during which the national forest unit gathers all pertinent information about conditions relevant to management of the forest, is the first opportunity for public involement in the forest planning process. During this period, USFS officials will seek out input from a range of sources, including state agencies, local jurisdictions, and interested citizens. The plan development phase is where local stakeholders have the best opportunity to provide input into how the national forest unit should be managed and what the priorities ought to be. Suitability of lands – identification of areas within the national forest unit suitable or unsuitable to specific uses (such as timber harvest, recreation, etc.). With regard to watershed health, all forest plans are directed to identify priority watersheds for maintenance or restoration of health and function. That said, forest plans are also intended to address a variety of other purposes for which the national forest was designated and ensure long-term, sustainable management of those values. While undergoing the plan development process and incorporating input into the planning process, the USFS must also review the plan according to National Environmental Policy Act (NEPA) regulations to ensure that the environmental impacts of the new forest plan are minimized and/or mitigated. In the Verde River watershed, the opportunity for engaging in the forest planning process on the Prescott National Forest (PNF) has recently closed. The PNF Land and Resource Management Plan was completed and adopted in June of 2015, and will now guide PNF’s management activities until 2030. Click here to view PNF’s plan. The Coconino National Forest (CNF) is entering the final phases of the forest plan development process. A draft plan has been released and is anticipated to be approved in early 2017. Click here to view updates on the CNF’s forest plan process. The Tonto National Forest (TNF) is just beginning its forest plan revision process. For those interested in the management of the lands affecting the lower reach of the Verde River and the reservoirs of Horseshoe Lake and Bartlett Lake, this is an opportune time to become engaged. Stakeholders who are interested in becoming involved or sharing information or input in TNF’s planning process are encouraged to visit the following site for additional information. The USFS has also been developing citizen-oriented resources to help facilitate public engagement in the forest planning process. If you are interested in learning more about the process, and how local communities and concerned residents can get involved, the following link will take you to a recently published report on this topic.